Announcing that rare parenting book that will not only help you become a more effective parent but actually change how you see your children. 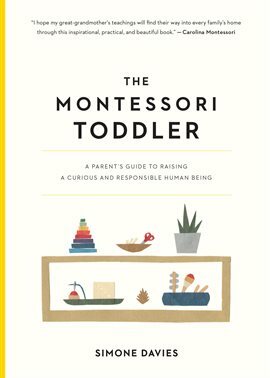 Written by Montessori educator Simone Davies, this book shows you how to bring the educational values of a Montessori classroom into your home-while turning the whole idea of the "terrible twos" on its head. Here is how to set up Montessori-friendly spaces in your home. Principles for fostering curiosity in your child-and in yourself. Specific Montessori skills-the winter coat flip; getting your toddler to pour his or her own water and clean up whatever spills might occur. And it goes much deeper, showing how a parent can really be present, be the child's guide, and handle tantrums and problematic behavior without resorting to bribes, threats, or punishment and truly celebrate every stage. It's also that rare parenting book that's beautiful to look at, with a bright, airy design and simple color illustrations and photographs.